Lithe Audio IP44 Bathroom Bluetooth Ceiling Speaker with echo dot compatibility, this special No Pin model works with Amazon Echo Dot. Wirelessly stream your audio from any Bluetooth enabled device such as an iPhone, Ipad, Andriod phone or Bluetooth enabled PC. 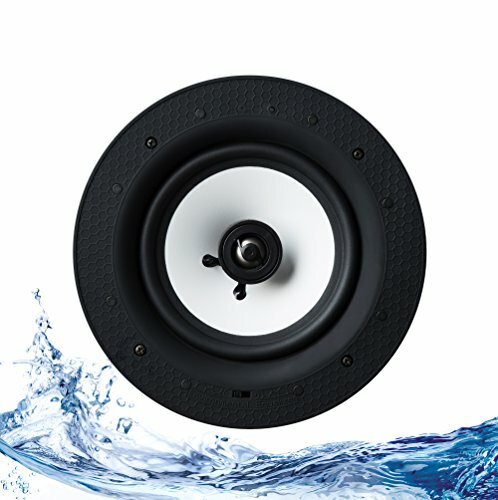 The IP44 rated ceiling speaker is ideal for Bathrooms, whether you are singing in the shower or relaxing with some soft music in the bath, this Bluetooth Ceiling speaker delivers smooth rounded tones with pin sharp clarity. The speaker has a protective metal grill which can be painted in ceiling paint, allowing you to seamlessly blend it into the décor of your chosen room. A rapid-mount system makes installation easy and fast. Wireless range is up to 10 metres It can also be hardwired to any non-Bluetooth device via RCA input to allow playback of audio from stereos, televisions or computers. Hard Wiring Details: The power brick (supplied) should not be placed in a dead space such as a wall or ceiling. To meet NEC code for these types of installations you will need to order a DC extension cable and place the power brick inside or on top of a Kitchen cabinet for accessibility. Each situation is unique. The extension needs to be minimum 18 Gauge to support 24v dc. Search B01GDR69WG for this 20' Extension or B01MRCKU1X for 50' Extension that will work well with this speaker. Don't hesitate to ask questions below for any help you may need. If you have any questions about this product by Lithe Audio, contact us by completing and submitting the form below. If you are looking for a specif part number, please include it with your message.